Split 9 Patch fabs chosen and cut. (Borders will be cut later...) I have a perfect black/turq/purple fab that I can use for backing. The pieces are SO little!! Heh. Looks like we're on the same page, Gloria :lol: You know, I know in my brain the difference between turquoise and aqua and teal, but I'm never comfortable using the color names when talking about them because "that color" seems to be so subjective! It's simple. It's not a large project. There's still plenty of time to catch up. I thought I'd make a little quilt for Halloween decorating. Glo!!! your fabric choice for this is spot on !! Wow....you girls are really a bad influence on me! I think I'll go revisit this pattern........stunning! Golo, mine's in block form right now, though all of the blocks are done. Mr. W. decided we needed to do some yard work while it was still raining (Okay, he THOUGHT there would be sun breaks. And there were. Right after we finished. :sun22: ) so I had to leave the blocks untrimmed and un-sewn together. OH - and I'd be sure to NOT pick a directional fabric for my medium or light. 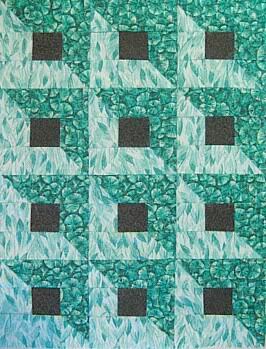 I actually had to pay attention when piecing the HSTs and the blocks. I'm going to pass on this....too much going on now. If i have to do all that cutting i'd just as soon do a full size quilt....somewhere in the vast mess that is my Quilting folder in my IE Favorites I have a pattern for this......these are 9 patch blocks cut diagonaly and resewn. which I'm thinking might be easier...I have no experiance doing nine patchs...only made one or two in samplers so far. its a stunning pattern. I'll see if i can find that pattern. update...can't find the pattern...maybe i was dreaming?? I did find this useful tool however. So, Gloria - what did you do about matching the seams between rows? I pressed half of the ones that joined all 3 rows of the 9-patch toward the center and the other half away from the center, so I could nest the three blocks across. But I'd already pressed the seams of the top and bottom rows of each 9-p toward the center (and pressed the middle row away from the center) so that I could nest them within the block. Each block went together fine... but when I butted the blocks against one another was when I ran into trouble. Had I thought it out, I guess I would have pressed the seams open (not a fan of that method!). As it is, I have 6 layers of fabric pretty well matched together. At least the seams aren't really obvious, so I guess it will be okay. It's not like I'm going to enter this into a competition. Hmmm. Another reason to cut rectangles rather than squares. I'm loving how this looks when I squint or catch it out of the corner of my eye - I really see the 3-D-ness of it! I think this is going into my Christmas club stack. My granddaughter would probably love it as a doll blanket. Or my friend at church might love to hang it on her wall at work. Hmmm. excellent..you both did whip these together quickly! No, the fabs don't fade to blue - that's just my shadow. It's a pita to get decent pictures when I sew mostly after dark!! I got my center pieced. I pressed half of the blocks with the seams towards the center and half to the outside..which helped line them up..but I didn't press half and half as did the nine patch piecing. If I had thought ahead more I could have done..just didn't think of it. I have the border fabrics just laying up against 2 sides to see how it will look. Thanks! I thought it would make a nice candle mat..or draped over the edge of a basket or something? I don't have any GKs to make dolly quilts for. WOW! You are fast Golo!! That is beautiful!!! FB, I love yours also!!! Had to go back in the thread to check it out! Love this one! FB..yours turned out SO cute! I have some of that lighter aqua. ;) The orange and the light w/stars I used came in a big box of fabric I bought online from a lady that wanted to de-stash. She's part of the Prim applique group and those fabrics just wouldn't fit in. I got a huge box of gorgeous fabrics from her real cheap. I didn't even know what I was going to get but she said there was a lot of Moda marbles..and there were, but a lot of fun extras too! Golo..Wowie wow wow! You're all done? such pretty fabrics too! Hahaha..I had my border fabric laid out wrong. I'll have to make sure I have it right when I sew it?